The information you post. We collect information you post in a public space on our website or on a third-party social media site belonging to QboxVisuals.com. Demographic information. We may collect demographic information about you, the events you like, the events you intend to participate in, the services you buy, or any other information provided by your during the use of our website. We might collect this as a part of a survey also. We collect information directly from you. We collect information directly from you when you register for an event or buy any service. We also collect information if you post a comment on our websites or ask us a question through phone or email. We use the information for marketing purposes. We might send you information about special promotions or offers. We might also tell you about new features or products. These might be our own offers or products, or third-party offers or products we think you might find interesting. Or, for example, if you buy any service from us we’ll enroll you in our newsletter. We use the information to send you transactional communications. We might send you emails or SMS about your account or a purchase. Email Opt-Out You can opt out of receiving our marketing emails. 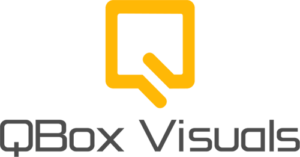 To stop receiving our promotional emails, please email unsubscriber@QboxVisuals.com. It may take about ten days to process your request. Even if you opt out of getting marketing messages, we will still be sending you transactional messages through email and SMS about your purchases.